Pajamas are my very favorite Halloween costume base. There, I said it. For about $20 you buy something that your child can sleep in for a year — what a value! Here are a 15 of my favorites for this year. Skeleton. Our go-to pajama-based costume is this skeleton from Carter’s. About $10 or $12, it never goes out of style.The legend is true that all five of our little ones were pajama-skeletons for Halloween, some of them more than once. It also comes in purple (but why?). Skeleton jammies come in all sizes! Unicorn. 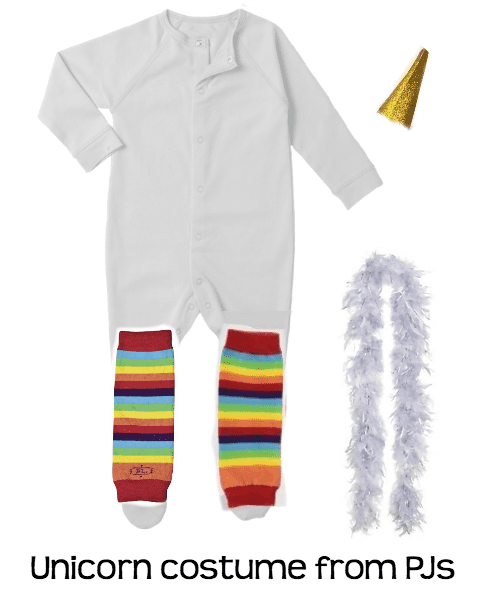 With a few embellishments, white or rainbow pajamas can be made into a sparkly magical unicorn. We used white pjs, gold sticky foam for the horn, a sparkly mini boa for the tail, and rainbow babylegs just for fun. Darth Vader. These Hanna Andersson Vader pajamas make the Dark Side cozy and don’t come cheap, but they’ll last forever (or half the price and with cloak on amazon!). I bet you already have a lightsaber (for $7, red is a must, ok?). The pictured mask comes with a cloak for about $8 but my preference would be the amazing voice changing helmet (which I purchased for my own birthday!). Keep with the Star Wars theme with Stormtrooper and Chewbacca hooded jammies for siblings or besties. Mummy. Scary adorable Mummy Pajamas are another simple twist on my favorite theme of ADD NOTHING. Doc McStuffins. We love Doc in my house and these Doc McStuffins pajamas are perfect for your little doctor- or vet-in-training. Her candy bag can be a medical kit, but why make things harder? Giraffe. I’m a big fan of Leveret’s affordable cotton and fleece pajamas. I have many sets and put them through all three sons when I can, so I’m not messing with you. I love these cozy giraffe pajamas and snuggly leopard, and they come in many sizes at a good price. Zebra. Check out these cute zebra fleece footies and all you need are the zebra ears with tail. Or just the pajamas because we can easily recognize this cutie already. Batman. These fleece footy Batman pajamas are perfect for trick-or-treating without a coat. Sawyer loves his set for family camp-outs. While you might want a mask and cape for home costume play, I vote to keep the face clear for safety (which means: ADD NOTHING and go!). We also have — and love — these Spiderman fleece pajamas with a hood. Clown. This clown is a sweet little toddler teddy bear wearing her polka dot pajamas, rainbow wig, and Julian’s silly clown collar. Make her scary or sweet with face paint and red nose. You can add the clown accessories to any set of colorful pajamas. Adorable for a toddler on up through a grade schooler. Mouse (or any other gray animal). First check out Primary.com where you can save 25% with code AFF25PCT. If all 50 shades of gray are sold out on Primary.com, you might need to get a little creative with Leveret leggings (so many colors). You can add cute mouse ears with tail (and bow tie!?) or extra bits from any other gray animal you love. These jammies come in asphalt (dark gray) or heather plus a ton of other colors to be your canvas. So if you have a piggie snout or duck bill lying around, solid pajamas might be your ticket! Brobee and Plex. Yo Gabba Gabba character pajamas are two for $20 — what are you waiting for? Choose one or share with a friend later! Woody and Buzz. Another favorite in my house! Toy Story superstars, Woody and Buzz (add a cowboy hat for Woody for $11). If you decide to accessorize for Buzz with a cool space gloves for about $7; a versatile space helmet for $7; and a full-on jet pack for another $11, I might direct you out of the pajama section and back toward a complete costume instead. Christmas Elf. These green stripe pajamas can turn your child into a Christmas elf as soon as you find a funny elf hat. If it feels a little incomplete, you can add a DIY red vest. Boom. These jammies also work for your holiday card photo shoot which you should totally already be working on. Ninja Turtle. Without ever seeing a show, my four-year old has become a TMNT devotee. If Teenage Mutants are allowed your house, check out these choices: 2 piece TMNT PJs or footie pajamas with a cape. I’m a fan of the simpler ones, but I don’t have to wear them. With soft pajamas, your kiddo can easily fall asleep in the stroller. For a more realistic look, you can upgrade with a backpack to form the shell (something like this for about $20). Combat gear optional. Jack O’Lantern. In closing, I offer a classic. For about $15, your kiddo can wear these pumpkin pajamas until you get sick of seeing orange. I’d probably pair with solid green or brown leggings as a stem instead of the print. Maybe you can throw an orange blanket over your child’s lap? Have you created any memorable Halloween costumes from pajamas? Note: This post may contain affiliate links which won’t change your price but will share some commission. These are beautiful costume designs. My favorite is the skeleton design. You just saved Halloween. Trying to get my 2-year-old to wear his big brother’s hand-me-down homemade awesome robot costume was an utter failure. I searched for ideas, and this came up. Thank you! Yay, Stephanie! Comfy is key for many little ones.